They did, and Harvey visited Louise at her home on Cape Cod, followed by an Elderhostel trip to Yellowstone during the winter holidays. “Before I would consider marrying Harvey, I had to know I could travel with him,” Louise says. They could, and the couple married Nov. 21, 2009. They now split their time between their homes at Kendal and Cape Cod. “Some suggest that longer lifespans have contributed to increasing divorce at older ages as people realize they have many more years to live and want to find fulfillment in that extra time. The same factor may be contributing to increases in remarriage among older adults,” the Pew researcher explains. Also, according to the Pew Research Center, the number of people over 50 who are cohabiting with an unmarried partner jumped 75 percent from 2007 to 2016. Though at least one relative suggested cohabitation, Harvey and Louise, now both in their early 80s, never considered the option. “I felt that the marriage commitment was important,” Louise says. She was first married in her mid-30s, but was widowed less than five years later. A second marriage ended in divorce. 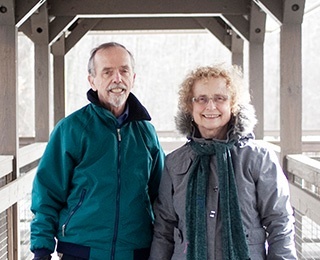 Louise is a Quaker, and in following the Quaker tradition, the couple married each other without a minister, witnessed by all those who were present at the West Falmouth service. They exchanged matching wedding bands, designed to resemble pebbles on a beach. As marriage plans were finalized, the couple worked on living arrangements. Louise had visited Kendal years earlier for a Try It, You’ll Like It stay. She did like Kendal—and coincidentally Harvey and his wife Alice were her hosts for the visit—but hadn’t decided about moving there. Then Harvey came into her life. “Moving to Kendal, it was a big plus to have a companion, lover, friend to be with,” she says. Harvey decided they should move into one of Kendal’s newer cottages. “Let’s start a new marriage in a new place,” he told Louise. That was fine with Louise, who had one request. “I asked Harvey to carry me over the threshold,” she says. Louise wanted to also keep the house she built on Cape Cod. The couple spends summers there. After their lives first intersected at Oberlin College, their careers took them in different directions. Harvey worked in medical physics and lived in La Grange, Illinois. 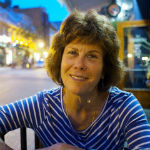 Louise spent 20 years coordinating the neural systems course at the College of Osteopathic Medicine at Ohio University in Athens, then retired to Cape Cod. Harvey and Louise have decorated the Kendal cottage to reflect both their interests. The walls are painted in bold colors of bright yellows and green. Louise enjoys painting watercolors and working on other art projects, so the den has been turned into an art studio. Harvey is an avid jazz lover, and often plays music from his extensive collection. Artwork collected from their worldwide travels, both before their marriage and since, are displayed in the living room. Together they have traveled to China, France and Crete. They like to take the train to U.S. destinations, especially Utah where Louise’s stepdaughter lives. Harvey has four children and six grandchildren. Their lives together have been rich and exciting, living up to the "love and adventure" that Harvey was seeking when he first emailed Louise after their 50th reunion.